You may ask what would attract me to a cookbook that is dedicated to salsa. I chose to feature this cookbook because of my 12-year-old son's love of salsa and all things spicy. I contribute his love of Mexican food to the fact that I ate it a couple of times a week throughout my pregnancy with him. I realize that's not the case, but he enjoys hearing the tale. So, I knew he would enjoy reading this cookbook himself so he could learn about the various peppers used in the cuisine and find some salsa and pico recipes for us to try. The cookbook is absolutely gorgeous! The vivid photos of the ingredients - bright red tomatoes and luscious green cilantro - will leave your mouth watering. The book begins with a guide to chiles and how to work with them. The recipes are spread out over five chapters: classic table salsas, hot salsas, mole and enchilada sauces, salsas for tacos, and chunky salsas and botanas. One of the Mexican restaurants in my area serves what we refer to as "green salsa". I knew it wasn't tomatillo salsa (which I love) or guacamole (which I love even more). Through this cookbook, I have narrowed it down to Salsa Taquero (Spicy Avocado Sauce) or Salsa Mestiza (Avocado- Cilantro Sauce). I will be questioning my waiter on my next visit. I've never been happy with jarred salsa so I am thrilled to add this cookbook to my collection. With some much welcome experimenting, my family can have fresh salsas, pico de gallo and other unique sauces such as chimichurri, Salsa Gobernador (creamy sauce for fish tacos) and Creamy Lime Mayonesa. I can't wait!! If you're a Mexican food fiend like I am, you need this book! DEBORAH SCHNEIDER is the executive chef/partner of SOL Cocina in Newport Beach, CA, and was dubbed “the reigning queen of San Diego chefs” by Bon Appétit. She is the author of the James Beard-nominated Cooking with the Seasons at Rancho La Puerta; Amor y Tacos; ¡Baja! Cooking on the Edge, which was one of Food & Wine’s Best of the Best of 2006; and is the co-author of Williams-Sonoma’s Essentials of Latin Cooking. And with good reason—a great salsa makes a big impression with just a little bite. 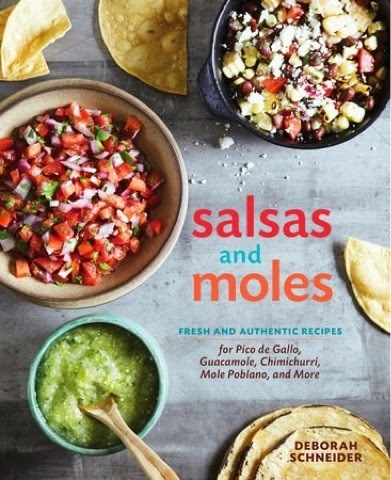 In Salsas and Moles, award-winning chef Deborah Schneider explores a wide variety of favorites, from classic table salsas to mole and enchilada sauces, plus chunky salsas and snacks. While some people think salsa is all about heat, Schneider teases out fresh flavors from chiles, fruits, and herbs, creating authentic recipes that showcase the unique flavors of Mexico.